Metabolomics is an invaluable tool of systems biology and has made significant contributions to a diverse number of fields, such as drug discovery, disease diagnosis, and personalized medicine. Unlike other OMICs techniques, an observed difference in the metabolome is directly correlated with a relevant biological response (a change in the biological activity of protein). The metabolome captures how the system responds to drug treatment, disease state, environmental stress or genetic modification. 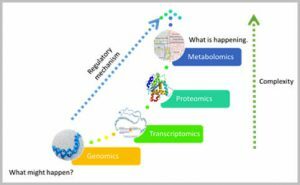 As a consequence, the application of metabolomics has increased exponentially over the last decade. A diseased-centered systems biology approach to drug discovery provides a unique infrastructure to identify novel druggable targets and therapeutic agents to increase the efficiency and success rate of drug discovery. One important component of this approach is the use and development of NMR and MS based metabolomics techniques to monitor the in vivo activity and selectivity of potential drugs. Similarly, metabolomics can be used to monitor disease development, identify in vivo mechanisms of action for novel drugs, and evaluate mechanisms of drug resistance. Additionally, metabolomics may be an invaluable approach to easily and rapidly diagnose human disease and assist in personalized medicine by monitoring a patient’s response to a particular treatment. Our metabolomics technology, including our MVAPACK metabolomics software platform, PCA/PLS-DA utilities, and protocols for integrating NMR and MS data, sample preparation and metabolite identification will be discussed. Also, our analysis of the mechanism of action and resistance of TB and cancer drugs, and metabolic processes related to pancreatic cancer, Parkinson’s disease and a potential diagnostic tool for multiple sclerosis will be presented. $15 employed / $5 students, postdoc, retired, unemployed. No charge for seminar only. Public Transit: It is possible to take NJ Transit all the way to Princeton campus (the symposium location is ~ 10 min walk from the train station). Take the Northeast Corridor NJ transit train to Princeton Junction, then transfer to the small “dinky” train that ends on campus (5 min train ride).